If you're seeing this article, it means you still have an old, unsupported version our iPad app. To continue to receive the latest breaking news, live video and severe weather coverage, please upgrade to the latest version of the app (requires iOS7 or higher). To upgrade, simply click here on your iPad to open the app in the App Store, then click upgrade. Or, go to the App Store and search for "NBC 6 South Florida." 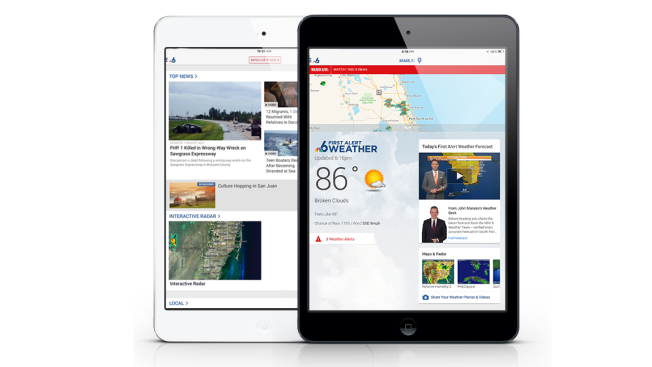 A sleek new design to make it easier to find the breaking local news and weather coverage you care about. Want more breaking news? Now multiple articles and videos can appear in the expandable alert bar. Look for the red arrow when breaking news happens. The beautiful new weather section is interactive and informative, providing both a quick glance at your day ahead and more in-depth data to help you plan your weekend and beyond. An improved interactive radar gives you more control when tracking storms in your area. Add additional layers for an enhanced experience. Our new severe weather notification system allows you to receive timely push alerts for multiple locations, whether it be your home, workplace or even your children's school. A new way to watch video. Play video and scroll through an article at the same time, or rotate the phone to watch the full-screen video.